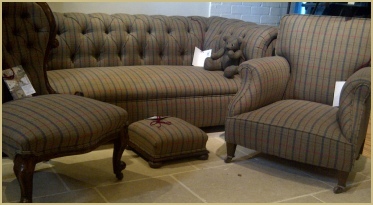 Visitors to Cotswold Woollen Weavers in Filkins so often admired the furniture we re-upholstered to show off our cloth, that we decided to look for more pieces that we could offer for sale in our Interiors Gallery. This has been so successful, that we generally try to have a dozen or so pieces, ranging from mighty Victorian 3-seater Chesterfields through Edwardian drop-arm sofas and armchairs to footstools. 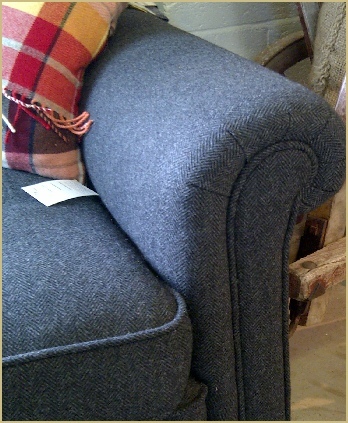 Do come to Filkins, and see our changing stock. We source the very best antique and vintage furniture, and completely rebuild and re-upholster as necessary to restore it to tip-top condition. All the work is done in England, and of course the cloth is all of our own Cotswold design and English manufacture. 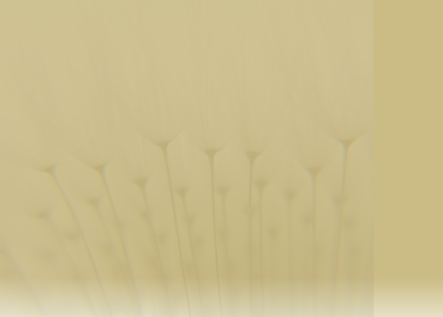 We are proud to up-cycle yesterday’s vintage as tomorrow’s heirloom. Please see our contact page HERE, for details of when we are open in Filkins, and please come and visit us. You are welcome to ring first to discuss current stock. Every piece of our rebuilt vintage furniture is, of course, unique, but our prices are usually less than for similar modern furniture. 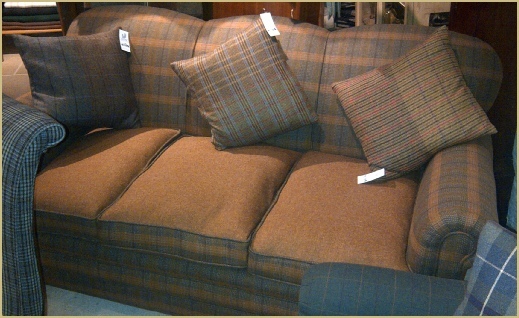 Prices range from about £100 for a footstool or £400 for an armchair to £2000 for a giant 3-seater Chesterfield sofa.